Beginners with Tros an Treys dancers going through the basics. Yesterday we held our first beginners’ workshop of 2019. We had 10 new people join us which exceeded our expectations – and – as was pointed out by our sole male dancer Courtney, men too! The format of the session followed the same lines as the mock session that was tried out on our musicians last week. Some of the beginners like them found it quite tiring at first and even though it was a cold day the great workout Cornish dancing gives you warms you up quickly. By the end the group was doing the North Cornwall Furry and serpents using the 1, 2, 3 hop! step. From a musical point of view we offered the beginners a range of our standard furry and 4/4 tunes: Tregajorran Furry (Neil Davey), Quay Fair (trad), Bolingey Furry (Will Burbridge), Bodmin Riding (trad), Heva (trad)–this worked especially well for dosi-do practice– and Dons Bewnans meaning Dance of Life in Cornish (Mike O’Connor) a favourite of ours. We like rewarding ourselves so in true Tros an Treys style we had a small tea party in the break. Possibly not the best idea before more dancing but it gave true meaning to the spirit of the Cornish ‘tea treat’. The beginners could also rest while Tros an Treys danced. 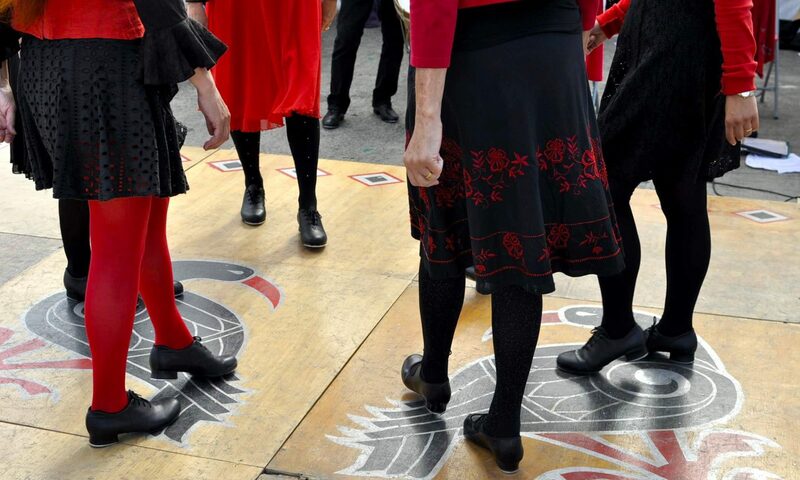 We displayed a dance called Cornish Squire to the tune Awel Vase meaning Fair Wind in Cornish (Hilary Coleman) and Ro Kernewek, a dance created by our very own Chris Jackson, meaning Cornish gift. This dance has now become a classic and we usually dance it to a reel called Begone from my Window (trad). The whole of Penlee Coach House looked very festive. 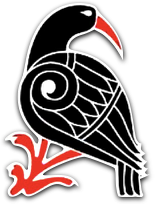 We were dressed in our signature colours: red, black and silver and we proudly displayed our banner with the gorgeous chough symbol. There was also bunting so no excuse not to have a good time. We can’t wait to see what happens at our next session on Sunday 27 January. If you are interested follow this link. Previous PostPrevious 1, 2, 3, hop!